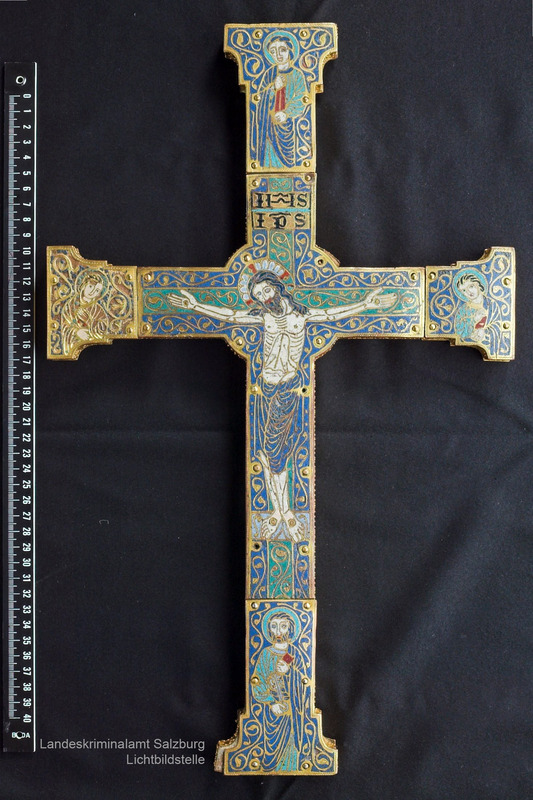 Zell am See, Austria 6 May 2008 – The Commission for Looted Art in Europe announced today the restitution to the heirs of the Działyńska collection at Gołuchów Castle Poland of a 13th century Limoges enamel processional cross discovered last year in Zell am See, Austria. The Collection was formed in the second half of the nineteenth century by Countess Isabella Działyńska née Czartoryska and became renowned throughout the world. It consisted of thousands of works of art, including paintings, Egyptian, Etruscan, Phoenician, Greek and Roman antiquities, medieval and Renaissance enamels, jewellery and silver and many other rare and precious objects. The Limoges cross was acquired in France by the Countess in 1865 and was displayed in her castle at Gołuchów in Poland for many decades. In June 1939, with the Nazi threat looming, Princess Ludwika Czartoryska, then guardian of the collection, decided that the most valuable and important objects should be removed from Gołuchów, which was close to the German border. They were hidden for two years under the carriageway of the family home in Warsaw but were discovered and seized by the Nazis in 1941. In 1944 the seized objects were moved on Hitler’s orders to Castle Fischhorn in Zell am See, Austria where they were looted again as the war ended. Soon after, the family sent representatives to Zell am See to search for looted items. But none came to light. In 2004 the cross was obtained in a house clearance by Mrs Lydia Gruber, a resident of Zell am See. She was looking through a skip filled with the discarded possessions of an elderly neighbour when she came across the cross. In August 2007 a friend took the cross for evaluation to the local Mining Museum at Leogang where it was recognized as a valuable and rare medieval Limoges cross. Investigations carried out by the Salzburg Police revealed its rightful owners to be members and descendants of the Czartoryski family and contact was made with the London-based Commission for Looted Art in Europe which represents the heirs. The restitution of the cross was negotiated by Jan Gruszkiewicz of the legal firm, Draxler & Partner of Vienna, together with the Commission, on behalf of the heirs. At a ceremony at the Mining Museum in Leogang this morning, the cross was returned to Count Adam Zamoyski, one of the heirs and Chairman of the Princes Czartoryski Foundation in Kraków where the cross will now be on display. The cross was acquired by the Countess Działyńska in 1865 from the Germeau collection and was subsequently published by E. Rupin in his ‘L'Oeuvre de Limoges’ in 1890. In 1903 it was extensively described and illustrated by Emile Molinier in his catalogue of the Medieval and Renaissance works of art in the Gołuchów Castle collection. The front features five enamelled plaques. The central plaque is of the Crucifixion with the Virgin and St. John on the terminal ends to the left and right; above, an apostle, and St. Peter below. The back is centred by a roundel of Christ in Majesty. To the left and right are the symbols of St. Luke and St. Mark. At the top is a plaque with the eagle of St. John and at the base the standing angel of St. Matthew. The back of the cross is further applied with five enamelled roundels, white on blue. The London-based Commission for Looted Art in Europe is the expert representative body in Europe dealing with all matters relating to Nazi looted art and other cultural property. An independent, non-profit making organisation, it negotiates policies and procedures and acts on behalf of families, institutions and governments worldwide to research, identify and recover looted cultural property. In the nine years since it was founded the Commission has been instrumental in the return of some 3,000 cultural objects to their rightful owners. 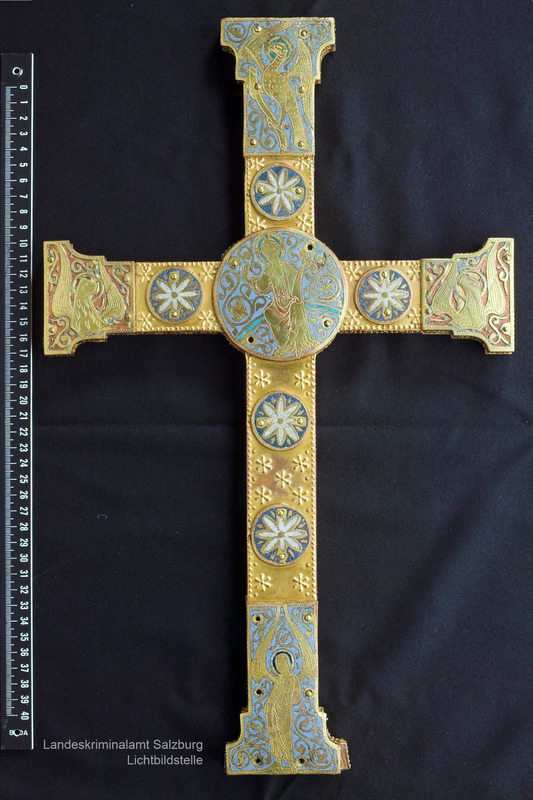 On 16 July 2007 the Provincial Office of Criminal Investigation, EB 06, was notified by the Leogang Mining Museum that they were holding an allegedly medieval, valuable cross and asked to investigate whether it was linked to any criminal action. Contact was made with the curator of the Leogang Mining Museum, who made the initial statement that the exhibit had been found by a person on a rubbish tip and handed over to the abovementioned museum. The cross is a passion cross, which were produced in the 12th and 13th C in the Limoges workshop. The object is made from gilded sheet copper and enamel and the front shows Christ on the Cross. Several medallions are affixed to the back. According to documentation provided by the Head of the Department for Polish Cultural Heritage Abroad, the cross is from the art collection of Izabella Elzbieta Czartoryski Dzialinska at Glouchow Castle/ Poland. Before the start of the Second World War, the then owner tried to save the collections from the Germans. She took the objects to the cellar of a house in Warsaw and there walled them in. However in December 1941 the hiding place was discovered by the Germans and the collection was taken to the Polish National Museum in Warsaw. Lists make it possible to follow the whereabouts of the cross. After the Warsaw Uprising the Goluchow Collection was taken to Austria, to Fischhorn Castle in Bruck on the Glocknerstrasse, which had been requisitioned by the Nazis at that time. From thereon, all trace of the cross is lost. During a clear-out in an apartment in Zell am See in 2004, the old inventory was thrown into a container for bulky waste in front of the house. A neighbour who loved old crockery obtained permission to take what she wanted from the container. While rummaging in the container, a gold-coloured crucifix caught her eye, which she was also able to take home with the permission of the apartment owners. As it did not fit in her apartment and her children did not want the cross either, she stowed it away under her couch, where it remained until 2007. In July 2007 she showed the cross to a neighbour with whom she was friendly, and who recognized that it might be a rarity and who for the time being took it to the Leogang Mining Museum. The curator of the Leogang Mining Museum, Herman Mayerhofer, handed the cross over to the Salzburg Provincial Office of Criminal Investigation. The cross was taken to Vienna and examined by experts at the Art Historical Museum. The bottom line is that it was established that the cross, with the exception of some replacements of a later date, was made in Limoges around 1200. An informed valuation could not be made as the Art Historical Museum does not have comparable exhibits. However, similar objects have fetched up to 400, 000 Euros at auctions in Paris or London. The Commission for Looted Art, London, which specialises in tracing WWII looted art and has already been contacted by the Polish Ministry for Culture, represents the heirs. After consultation with the Judge at Zell am See District Court, Mrs Brauer, MA, the exhibit was taken back to the Leogang Mining Museum as it can be stored there safely and adequately. According to the curator of the Mining Museum, the museum intends to exhibit this particularly valuable exhibit soon. Officer Oberst Josef Holzberger at the Salzburg Provincial Office of Criminal Investigation is also available as a contact for the media at tel: +43 (0)59133 50 3001.